Tell us a bit about America’s Best Cleaners and its Going Google. America’s Best Cleaners is a nationally recognized independent certification mark for the drycleaning industry. Affiliates are certified on an annual basis and once certified work together to share the best business practices in the industry. Our affiliates make up the best of the best in the industry and represent over 92 million dollars in gross revenue. The affiliation is spread throughout the United States with several international affiliates and industry experts sharing information and in depth discussions. 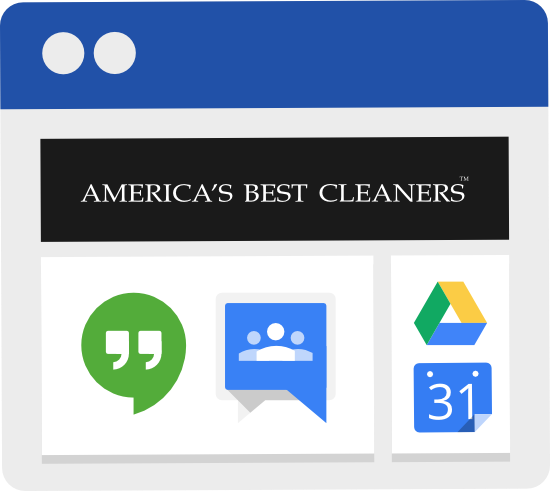 How is America’s Best Cleaners using Google Sites? We previously used Windows SharePoint Servers which allowed us the document sharing, discussion threads and image catalogs but the cost to maintain this service continued to rise along with the change is user behaviors and software usage. Google Sites allowed us to reduce the overall cost to operate, ease the cost of support and allowed a much easier login and user interface. Since most of our users already had a Google accounts, implementation was very easy. The integration of all of the Google services offered such as Calendars, Drive, Groups, and Hangouts has allowed us great reach to our affiliates and drastically lowered our overall cost to maintain such a platform. We have witnessed a major uptick in user participation and collaboration. This platform has also allowed as the ability to make better graphically appealing postings that allows us to stand out from other messages in the end users in box. "The integration of all of the Google services offered such as Calendars, Drive, Groups, and Hangouts...lowered our overall cost to maintain such a platform." The administration aspect is terrific as we are able to manage and modify our site on the fly without any major support. We are now completely centralized with all of our internal management tools in Google as well external usage with our client base. We now simply create individual drive folders for each account, control all access to to the folders and files and simply drag and drop from our desktops to the end users drive folder and they have it as soon as they are synced. Its that easy. How has your Google Sites intranet helped your organization? What has been the impact of the Intranet? Our users love it. First off they love that they can simply reply to discussion through gmail without having to log in. This has increased the participation level and allowed for more timely replies to time sensitive materials as well more robust discussions. The integration of Drive has been profound, we no longer need to worry about large email attachments not being accepted by various mail services along with the collaboration tools paired with Google Hangout has allowed instant value to our clients that was just too clunky in SharePoint. Once a project is done it is safely housed on drive easy to access at any point. Our ability to customize the Site layout at anytime has allowed us to place current projects front page on the site where the information that is needed is easily accessed instead of being buried under layers of fixed templates. Would you recommend other organizations consider leveraging Google Sites? Why? Absolutely! We deal with Small Business and the offering Google Provides at such a reasonable price cannot be matched. Many of our clients are now seeing the benefit of how we use Google and are building similar systems for themselves. With all of the tools available the need for individual software licenses from the Windows is not necessary. If you are running a business that needs to communicate with your team in a centralized easy to use platform with a robust suite of tools you will be hard pressed to find a better solution than Google Sites. Sites is an easy to use, easy to implement business tool that is continually improving. Its a very smart business investment.